The parent company to Worthington Distribution is Worthington Group, Ltd. Founded in 1975 as a security company, it evolved into Northeast Pennsylvania's largest full service security company/home automator/system integrator. In June of 1992, Worthington Group, Ltd. sold its dealer/installer operation to become a national distributor of home automation/system integration equipment and supplies. Today, Worthington Distribution is one of the largest full line distributors catering to the dealer/installer. The staff at Worthington Distribution has over 50 years of combined experience in security, home automation, telephone, access control, central vac, whole house audio/video (including CCTV and satellite distribution), home theater, and systems integration. We look forward to sharing our experience with you by offering real world technical support by field experienced and factory trained technicians, plus we offer free system design assistance and consultation. Offer products of current manufacture and technology, not odd lots and closeouts. Offer products by name brand reputable manufacturers, not "look alikes" or generic knockoffs. Sell products by name and model number; don't disguise them with marketing hype names and numbers. Sell at "True Dealer Price", not fictitious price just below list. Ship from stock on hand with no minimum order. Treat customers as you wish to be treated. We are your distributor - your source for product and technical support - not your competition. We don't want to have to lure you to us by saying, "We'll beat any published price," because we always give dealer price. And we work hard with the manufacturers to maintain the best possible pricing for all jobs - big and small. And we won't sell one item under cost to bait you in and then sell other items above dealer to make up the loss. "True Dealer Price" on all products all the time. We are the competition they say they will match. Today's home automator/system integrator is expected to be an expert in security, automation, HVAC, telecom, whole house audio/video, and many other fields, all of which are complex enough to be a lifetime career on their own. At Worthington Distribution we will assist you in choosing the right products that will integrate together, providing complete systems for your clients. 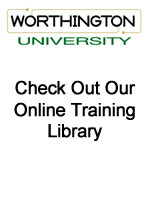 To find out more about Worthington Distribution's training programs, visit www.worthingtonu.com. Our online catalog is your Worthington Distribution edition. We listened to you, our valuable customer, and we hope you will find our new format and new features user friendly. Call us today for fast, continued service.